Natural baby wipes are one area that I’ve really been taking the easy, convenient road with since Yusuf was born nearly 2 years ago (already?!). Although Yusuf’s eczema has calmed down tremendously since we’ve traced the cause back to certain dietary culprits (mainly dairy and wheat), he still has some flare-ups in the diaper area that I just can’t seem to get rid of no matter what I try. His naturopath suggested switching diaper brands (which we’ve recently done), but I’m taking it one step further and taking him off of commercial baby wipes altogether, especially since he’s been complaining of a “boo-boo” as I’m wiping his little bum with the regular wipes. And with baby #2 due next month (!) now’s a good a time as any to finally make the switch to more gentle, soothing baby wipes. 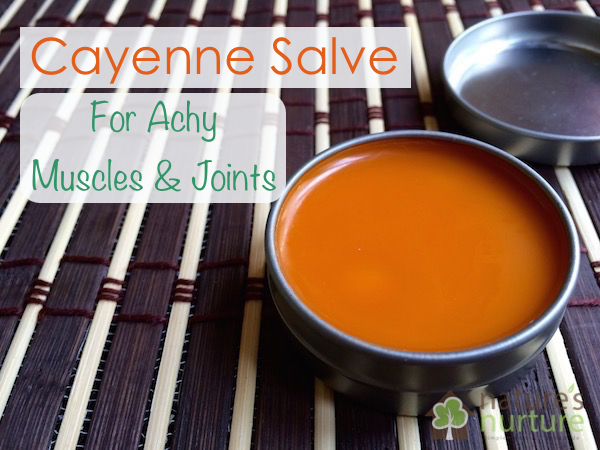 I did some research and settled on this recipe from Wellness Mama. I played around a bit with the recipe since my first batch came out a little too soapy and a little too wet. I don’t know if it’s because maybe my paper towel roll was a smaller size? I’m not sure, but I reduced the amount of water and soap in the recipe and it worked out much better for us. I also left out the grapefruit seed extract because I didn’t have any on hand. I knew the wipes wouldn’t make it past a week in our house, but if you think you’ll need yours for longer than that, then grapefruit seed extract would be an option. This recipe can be used either with a strong roll of paper towels (like Bounty or Viva) or some homemade reusable cloth wipes. If you’re looking for a way to make cloth wipes, Sara from My Merry Messy Life has a great tutorial for no-sew cloth wipes! I’m planning on picking up some fleece fabric soon to make those no-sew wipes, but in the meantime, I’ve made two batches with a roll of Bounty paper towels. You’ll need to cut the roll in half, which will give you 2 separate batches. Note: The recipe below is for one half of the roll. 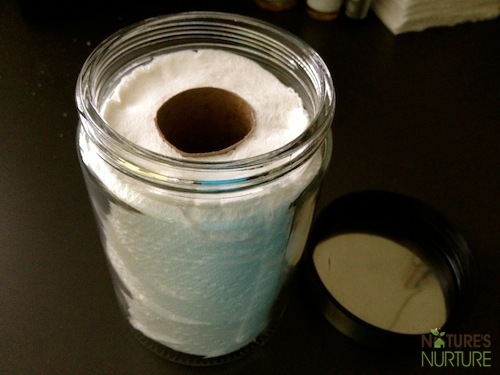 Depending on how you’ll be storing the wipes, you can either accordion-fold the wipes and place them in an old wipes container or something similar, or you can leave the towels on the roll, place the roll in a tall container, and remove the cardboard roll from the middle (more on that below). I did one batch of each method so you can see how each is done. Both are super simple and have their own pros and cons, so choose the one that’s best for you. Or leave the towels on the roll in a tall container. After mixing up the ingredients, you’ll pour the solution over the paper towels and allow it to absorb into the towels. For accordion-fold wipes in a wipes container, that’s where your work is done. If you’re keeping your wipes on the roll, you’ll have to flip your container over after about 5-10 minutes and make sure the wipes are soaked very well. Once they’re soaked, you can just pull the cardboard roll right out of the center and pull up one wipe, which will get the roll started. That’s it! Now you can use these as regular wipes that are pre-soaked AND pre-cut for your convenience. And you can rest assured knowing exactly what’s in your baby wipes and that they’re not irritating your little one’s soft little bottom! 🙂 These wipes are also great to use on-the-go as a quick wet wipe for cleaning little hands and faces while on the road as well. 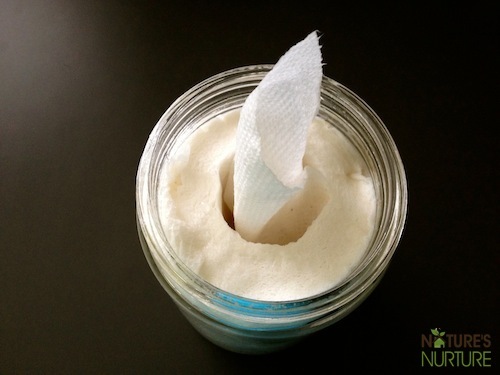 Make your very own baby wipes with all-natural ingredients! 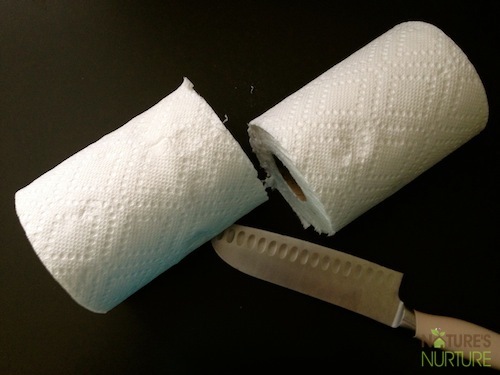 Cut the roll of paper towels in half with a sharp, non-serrated knife. 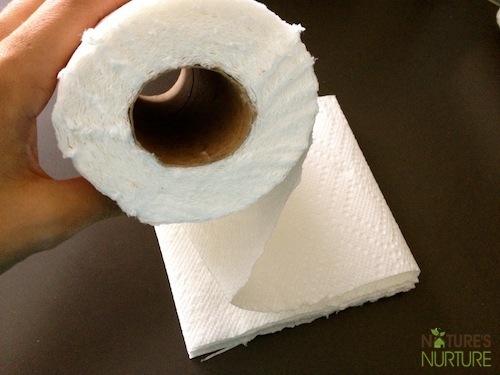 Place one half of the roll in a tall container (or accordion fold the towels and place in an old wipes container). In a small bowl, add the water, castile soap, aloe vera, witch hazel, grapefruit extract, and olive oil, and stir to mix well. Add the essential oils and stir to combine. Slowly pour mixture over the towels to saturate them. If you're using a wipes container, just pull the towels through the little slot in the cover and you're done! 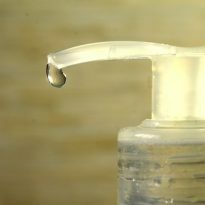 If using a tall container, flip it over after 5-10 minutes to make sure the towels are completely wet with the solution. Then flip it back over, pull out the cardboard roll from the middle and the first towel should come right out. Use as you would regular baby wipes. 1. This recipe is for one half of the paper towel roll. Depending on the brand and size of your towels, you may need to adjust the amounts of water and soap in the recipe. 2. If using reusable cloth wipes, just pour the solution into a shallow pan and place the cloth wipes in the solution until they're saturated. 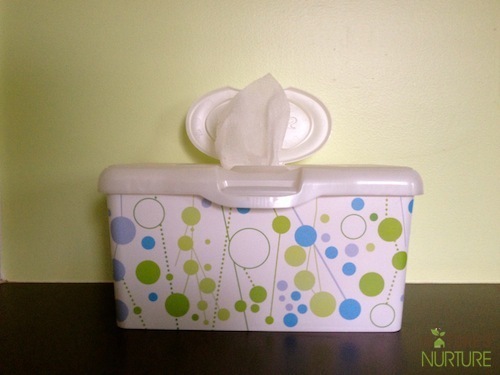 Then just place the wipes into an old wipes container and use as you would regular wipes. Water – Distilled water is best, or you can just use boiled water that has been cooled to the touch. Regular, unboiled tap water contains too many contaminants which will most likely start to grow bacteria in your wipes container almost immediately. Castile Soap – An all-natural, oil-based soap that’s super gentle on the skin. 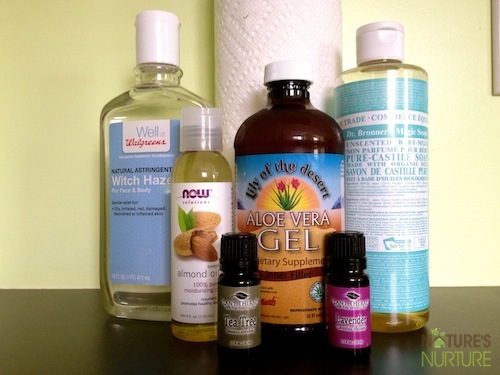 Dr. Bronner’s baby mild is my favorite for this recipe, but you can use any scent you like. Can be found at your local health food market or online at Amazon. Aloe Vera Gel – Acts as a moisturizer with natural anti-bacterial properties. Make sure you’re using the natural aloe vera gel, not the green stuff found at the drug store. Best place to purchase is either at your local health food market or online at Amazon or Plant Therapy. Witch Hazel – Acts as a preservative and has soothing and anti-bacterial properties. Use one with a small amount of alcohol (no more than 14%) or an alcohol-free distillate. Can be found at any drug store or online at Amazon. 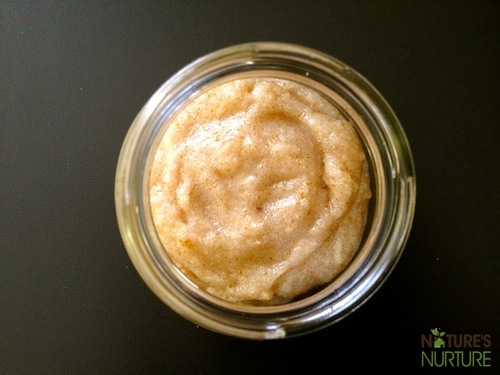 Sweet Almond Oil (or Olive Oil) – For moisturizing the skin. Can be found at your local health food market or online at Amazon or Plant Therapy. Grapefruit Seed Extract – Acts as a preservative. Can be found at your local health food market or online at Amazon. Essential Oils – Not only do essential oils add a nice scent to the wipes, but they can also add extra benefits like anti-bacterial, preventing and relieving diaper rash, healing irritated skin, etc. Good choices are lavender, chamomile, and tea tree oil. Can be found at your local health food market or online at Amazon or Plant Therapy. 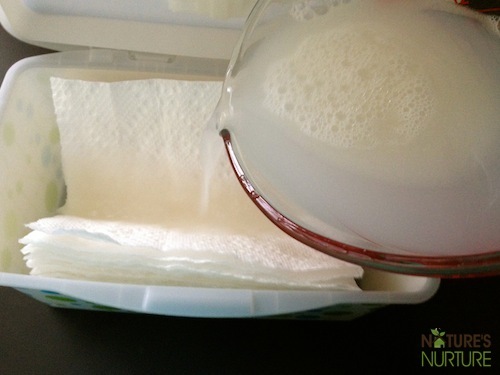 Have you tried making natural baby wipes? I’d love to hear about it! Thank you Sarah for this awesome recipe. I am writing concerning your son & just some FYI. I have a couple autoimmune deficiencies, one is a skin problem. I was told by my specialist to stay away from tea tree as they have found that, although it appears to originally clear up skin issues, most are sensitive to it and it will actual cause issues. Unfortunately many will continue to use it due to it initially clearing things up, but it is actually the culprit. You may want to try omitting this oil for awhile to see if things change. I am excited to make your recipe for my new grand baby who will be here soon. Very interesting, Mary, thanks for sharing! How long do these last if u pre make them? A few months? Less? That really depends…If you use distilled water and the grapefruit extract, I’ve had them last for a couple months. Not sure about longer because I’ve never made a big enough batch to last longer than that. Always check them from time to time, and if they look or smell off, just toss them. No, I don’t recommend using lemongrass oil near little ones. 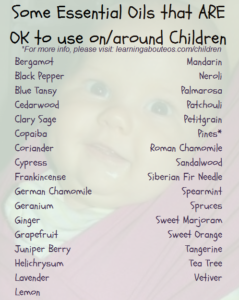 For a good resource on safe oils for use around children, I consult with this graphic: http://www.usingeossafely.com/wp-content/uploads/2016/10/useIMG-239×300.png (although dilution is very important, especially for children under 2). Where did you find your jar? Thank you!!! Hello I’m very interested in trying this recipe. I’m using it as regular wipes instead of baby wipes . I’m confused about one thing. Do i add 10-15 drops per essential oil ? No, it’s 10-15 drops total. In terms of the paper towels that are used, how do you know what is in the towel themselves chemical wise? Thanks for your lovely posts!! Wondering if it is actually witch hazel EXTRACT that we need or can you just use witch hazel? Clearly the amounts would be different… just checking to verify that it its indeed the extract for this recipe- never actually seen witch hazel extract before! Just wondering if anyone has tried this recipe with high-quality toilet paper for a flushable version? I have an almost-four-year-old who could use those when he poops, and it would save me money on buying the store-bought flushable wipes. Not to mention I would know what is IN them. Anybody tried that? Hi! May I know how long will this recipes last? I mean the expiry date. 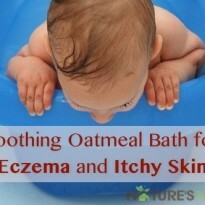 By the way, I have tried your recipes on soothing oatmeal bath for my son and it helps. 🙂 I am trying to use all natural and homemade products. It is all started when my son’s eczema seemed to be depending on medications; steroids especially. So I thought I need to work on something better. 🙂 Thank you for a such inspiring blog. I’m not really sure how long this recipe will last, but I’ve never had issues with mold or anything. Though I do have 2 babies in diapers, so we go through a lot of wipes around here. If you’re thinking of doubling the recipe to make more and keep on hand, I probably wouldn’t just because I’m not sure how long it would last. You might try storing the second batch in the fridge though. 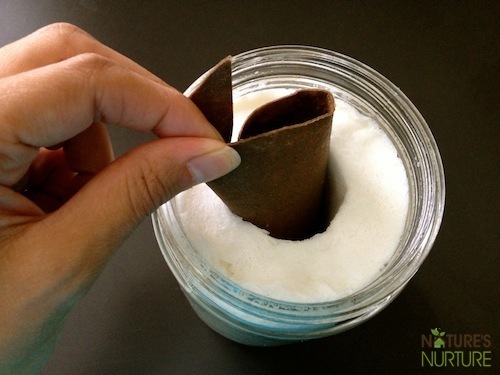 I am wondering if this would work just with distilled water in a closed container of paper towel wipes??? Thoughts on how much to use and/or if it looks safe? It looks like it has a lot of the ingredients that are recommended: Grapefruit seed extract, witch hazel, aloe….any help would be appreciated! We typically just use witch hazel on cotton pads or paper towels, so that should definitely be safe! Do you use regular size paper towels or select – a – size? I bought the regular size ones but they aren’t fitting in the wipes container as nicely as yours do. I used the select a size, but honestly I had to kind of really push them down in there after they were wet with the solution. 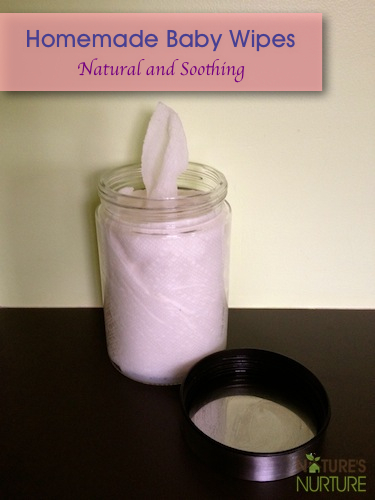 What is the glass container you have your homemade wipes in and where can I get one? What would you recommend for a solution with which to just have at my diaper changing station in a bowl? I just keep plain tap water in a bowl right now and dip a cloth in it to clean my baby but I am wondering if that is the best way or if there are risks of bacteria. I am using a BPA-free plastic bowl, but am wondering about switching to glass, and/or a different solution…thoughts? I got the container from my dollar store (Dollarama in Canada). 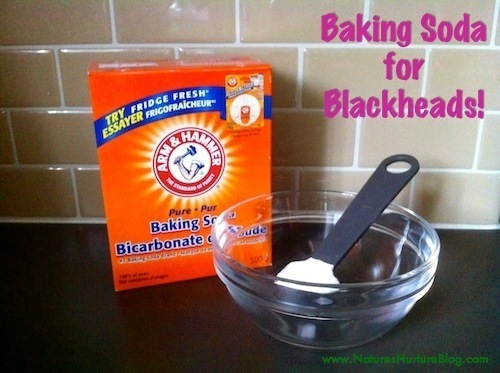 You could always make this solution and pour it over your wash cloths and store in a glass container. Or if you use the bowl method, I would just use a glass bowl that has a lid, so you can cover it when not in use. Wow!! This is revolutionary. I, too, am not the biggest fan of “all-natural” stuff. God knows what’s really in them. Where can I get a bottle like that, though? I for it from our dollar store! I made some wipes recently using water, Burt’s Bees Wash and a bit of olive oil. The molded in a week’s time. Any ideas on what to add to combat this? I know some essential oils are naturally antifungal, but there are some (tea tree I think for one) that aren’t safe to use on boys. If your using an essential oil that doesn’t have anything synthetic in it such as doterra tea tree oil is fine on children boys or girls wherever you heard that at is false. Hi, This is a great recipe, thanks for sharing it! Where can you find Optiphen ND and what exactly is it? please specify NOT tap water, as it contains bleach/chlorine and in many instances fluoride. bounty???? these -and other commercial paper towels- are bleached…..iit would be better to use the recycled paper towels, often beige, that are not bleached…. you might want to try using cloth diapers rather than wrapping your baby in plastic …..
Have you tried colloidal silver gel for your sons eczema? 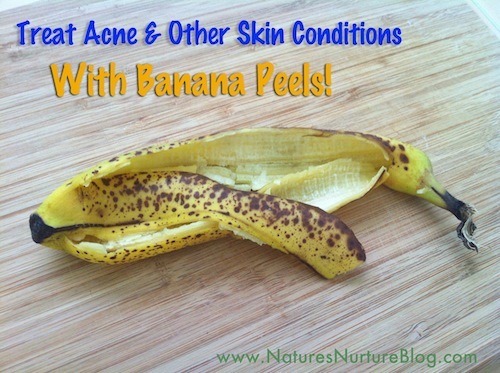 That’s the only thing that will cure my sons breakouts. I bought mine on Amazon. It might help. Thanks Liz. I’ve heard of the benefits of colloidal silver, but never for eczema. I’ll have to look into it. Thanks again! Hi! I’m wondering if you’ve ever tried making the solution ahead of time in bulk and then just using as much as you need for the wipes each week. I would love to try this, and it seems that the preservative qualities of the witch hazel, tea tree oil and grapefruit extract could really help to keep it well, but just wonder if you’ve tried or thought about it. Thank you for this great post – I’m looking forward to giving it a try. The most I’ve done is made an extra batch (with the other half of paper towel roll) and kept it in the fridge until the first one was used up. I’m not sure I’d feel comfortable making more than that, as I’ve heard of issues with molding, etc. so don’t want to risk it. My kids are both grown, but I remember how time crunched I was. I would think you could make batches of liquid to keep in fridge in mason jars. Even keeping spare batches of wipes in the fridge. Surely between the preservative oils and the lower temp the chance of mold would be lessened. And if there is a really sore bum, the cool wipe would actually feel good. wonderful recipe! where did you get your glass container? From the dollar store! 🙂 But honestly, I prefer the repurposed wipes container more. when i first saw it it looked like gauze to me for some reason or cheesecloth what im wondering is can one make the wipes from clean rags. This has to be witch hazel extract and not regular witch hazel you get in the big bottles right?? How do you place the accordion cut wipes in the store bought wipes cases? In the image above it looks like the wipes are standing in the tub but I’m not sure. Thanks for your input and great post! Hey Rebecca, I’m sorry for the confusing picture – I think it’s because I was pouring the liquid solution over them, which caused a sort of dip down the middle and that’s why they look weird. But really, it’s super simple – I just laid them flat into the container. So when I pick up one sheet, the rest of the accordion goes down into the container vertically. I like the recipe, but have you considered the chlorine used in almost all bathroom and kitchen products? The paper towels you suggest using have a horrendous impact on our bodies as well as the Earth’s, due to the chlorine and other chemicals used to produce them. I prefer to use products that are chemical free, perhaps even recycled. My skin is very sensitive and I am affected by chemicals, maybe your baby’s bum is too? Thanks for your comment and you’re absolutely right, Nico. And that’s why I also mentioned in the post the alternative of using washable cloth wipes, since that’s really the very best solution. 🙂 Since our second baby was born a few weeks ago, I’ve finally bought some fleece fabric to make our reusable wipes and can’t wait to start using them. But for those who must use paper, the reality is that the thicker paper towels are the only ones that are strong enough and will hold up as a baby wipe. Although we mostly use cloth in our kitchen nowadays, we usually have 1 or 2 rolls of eco-friendly paper towels lying around, and they’re usually much thinner and not as soft as Bounty or Viva, so they wouldn’t work as baby wipes. Are there safer/natural paper towel brands? I’ve seen several tutorials online for DIY wipes using paper towels but I am concerned about what is actually in the *paper towels*. Perhaps that’s not really a concern though since I haven’t really seen anybody else ask this question? plain water, at room temperature, is the best baby wipe . . . .
Have you had any issues with molding? I’ve read of people having that issue. I really want to make my own wipes, because my husband has crazy skin allergies to chemicals, and I’m worried baby will have the same, but I don’t want to make a bunch just for them to get moldy. No I haven’t had any molding issues yet, although I’ve heard that’s a common problem. The witch hazel and grapefruit seed extract really are great preservatives so I think that’s why the mold hasn’t made an appearance. I also only make up one batch at a time just to be safe. The towels are all cut up and folded and ready to go, but the solution itself is made up as I need it. This is great! I don’t have babies anymore and thankfully never had some of the issues raised here. I like the idea of using the make up remover recipe though. This is the best post for baby wipes I have come across. I especially like the ingredients breakdown piece. I just made this for my daughter today. She is currently potty training her two and three year olds. They have such sensitive skin and I think this will really work well for them. I will also use these for hand wipes. 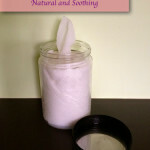 I am new to the “homemade” and “natural” personal care and home cleaning products. I am loving it! Great post! I fortunately don’t need wipes anymore! 🙂 I cut up old receiving blankets and used them as wipes. Wow I am definitely trying to save money and babies cost a lot. Thank for this post. Hmm no babies in my household, but I was thinking could use these as maybe makeup remover cloths? Hey Bridget, hmmm I’m thinking since the cloths will be used all over the face, including (and especially) the delicate eye area, that the soap and witch hazel may be a bit harsh and possibly even sting a little if it gets into the eyes. 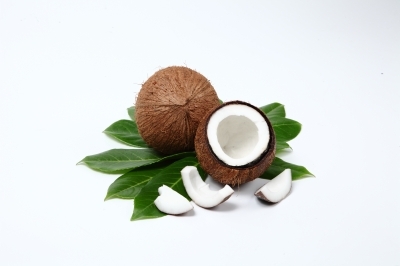 Hi again, yup, been using coconut oil, I was just trying to think of how to put it onto a wipe to use as a makeup remover. Ah well, I use the coconut oil in an old lip gloss roller bottle. Heat it up in your hands or in a cup of hot tap water, roll on, and it works. =) Portable too for vacations! Thanks for your tips! Wow! So neat. Never thought of using paper towels. This post is very informative. Thanks for sharing! If using paper towels are these septic safe? If not is there a simple, septic-safe modification that could be made? Hi Casey, I’m not sure if any paper towels are truly septic safe, so personally I wouldn’t risk it. In that case, I would use the solution with some reusable cloth wipes, if that’s possible. Great post, Sarah! I like the recipe you use and how you broke down the ingredients so we know why we should use them. With my first, I made wipes for him. (I’ve become a bit lax with my second…) I just used white vinegar, water, and lavender and tea tree oils. This recipe sounds great!